www.FourStrokeWorks.biz - Four stroke performance parts and service. FourStroke Works does it all!! Bronze valve seats for your head! Four Stroke Works now offers bronze valve seats to prevent extensive valve wear. This service is great to have for all bikes and an absolute must for the new Honda four strokes!! Help prevent costly bike repair and lost riding time. 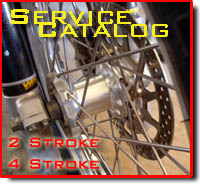 FourStroke Works prides itself on our technical expertise and quality installation and servicing. With over 35 years of performance servicing, you can trust your bike to the professional hands of our staff. Owner Jerry Leighton treats every bike with the same care he always has since his days with Stroker Inc and continued partnerships with professional riders. We not only provide the best service for anything KLX but we also specialize in all other bikes and ATV's. Whether it be general maintenance or performance modification, FourStroke works is the last stop for all your needs. When professional and amateur riders need the best service for their bikes, they trust their machines to FourStroke Works Servicing. Complete line of Rear Disc Brake Assemblies for NEW model bikes COMING SOON! Order online with your Credit Card, or by phone with Checks/M.O. Feel Secure and Safe through PayPal. Your privacy is important to us, and PayPal provides top security when making purchases.